With our excellent MIG, TIG and plasma facilities we can complete any request from a simple weld repair to a full fabrication either from drawing or a sample. 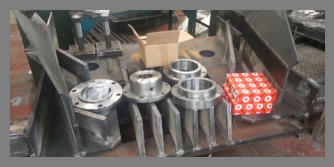 Any machining of the fabrication can be completed at our works. If it’s a weld repair on site that is required then we can complete too. Our welder is fully certified and any weld testing can be carried out also. 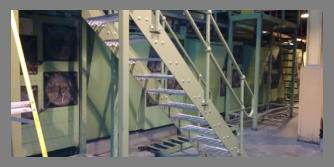 Steps manufactured and installed around machinery. A vibratory shaker unit manufactured for the car crank casting industry. The unit has been fully welded and precision machined in our works and supplied complete with fitted vibratory bearings and EN24T drive shaft. 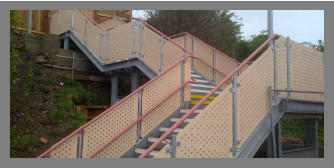 Pedestrian steps manufactured for installation at Stratford station embankment. 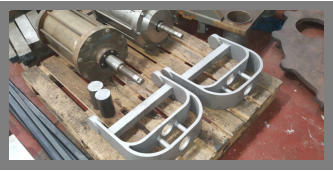 Two large cylinder clevis’s fabricated, stress relieved and shot blast ready for machining. 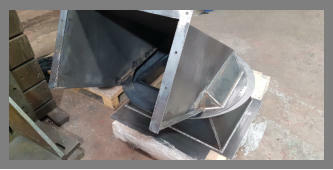 A conveyor roof chute designed and fabricated for an MRF recycling plant. 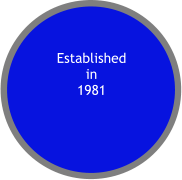 This was later installed by our on-site team after scaffolding had been erected to enable for it to be done so safely. A trolley fabricated for the marine lifting industry. 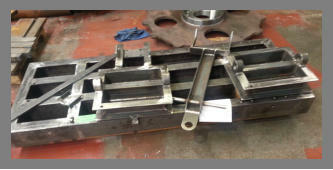 The unit was subsequently NDT tested and then sent for painting to an off-shore specification.